When your mom is extra and a Christmas Craft Party becomes a small birthday party... Ever since Ben was born, the holidays are extra joyous, extra special and extra fun. And now that Emme is here they are double the fun! There is something special about bringing the magic of Christmas to your child and seeing them light up at all that is pure joy this time of year. 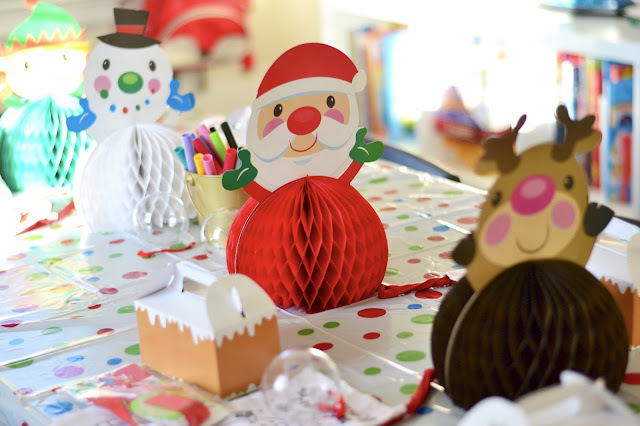 This time I planned a little Christmas Craft party at our house with their cousins. We made crafts and had pizza and sweets and all the kids had a blast. 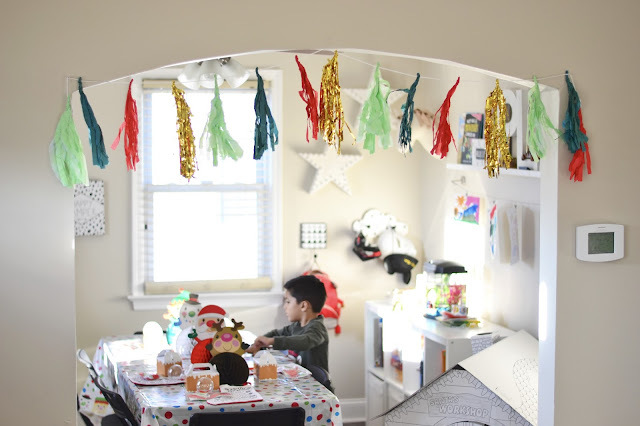 The idea of the get together was not just to make the ornaments and stockings but for the most part to make traditions and memories with Ben, Emme and their cousins. My plan is to have this party every year, I loved seeing the kids so happy and laughing. The kids didn't want to leave and Ben and Emme were worn out! 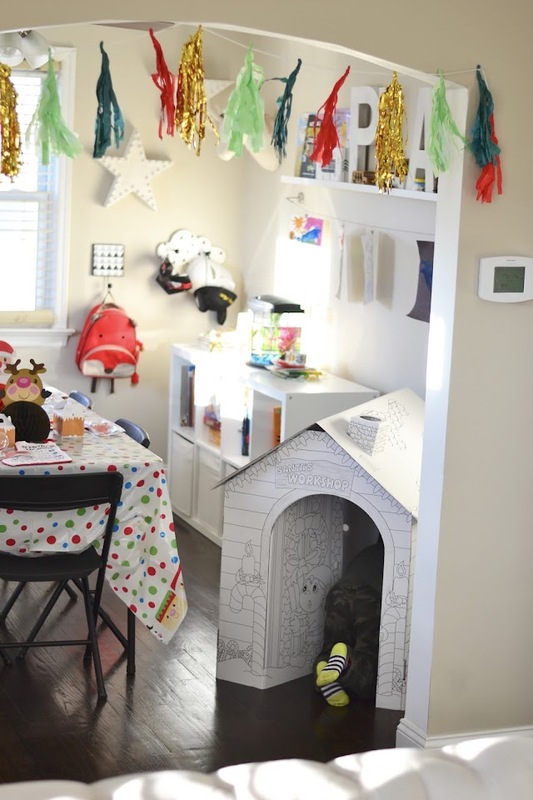 Because the kids ranged from 2-11 I knew I had to have different projects, so they were able to make their own personalized ornaments, color their stocking, create and decorate a gingerbread house and also help us decorate our cardboard Santa's workshop house! I like having a variety of projects so that each child can get their creativity going with whatever interests them the most. We picked everything up from Oriental Trading. And I loved the quality of it all. I love that they had everything I need in one website. From the table cloths to the napkins and all of my crafting needs. 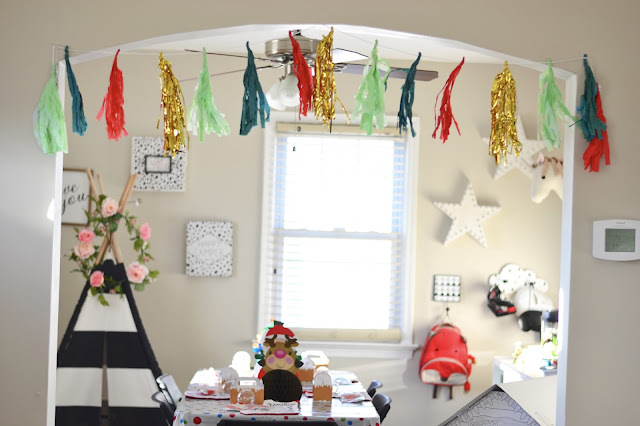 I even added decorations to the table and the kids loved it all! They were so excited when they saw how I set up the room. I love going the extra mile and making the kids happy. 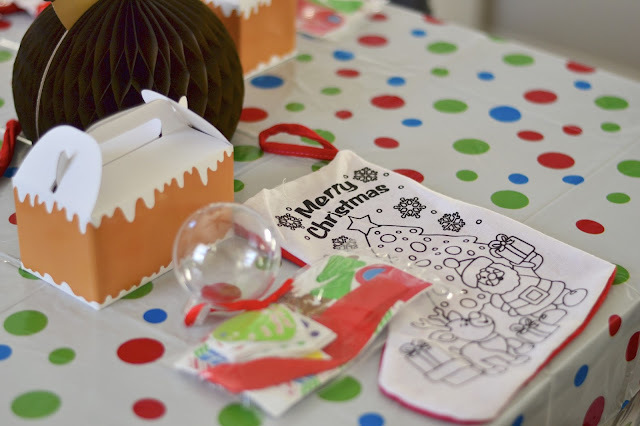 If you are looking to plan a Kids Christmas Party here are 3 tips: 1. 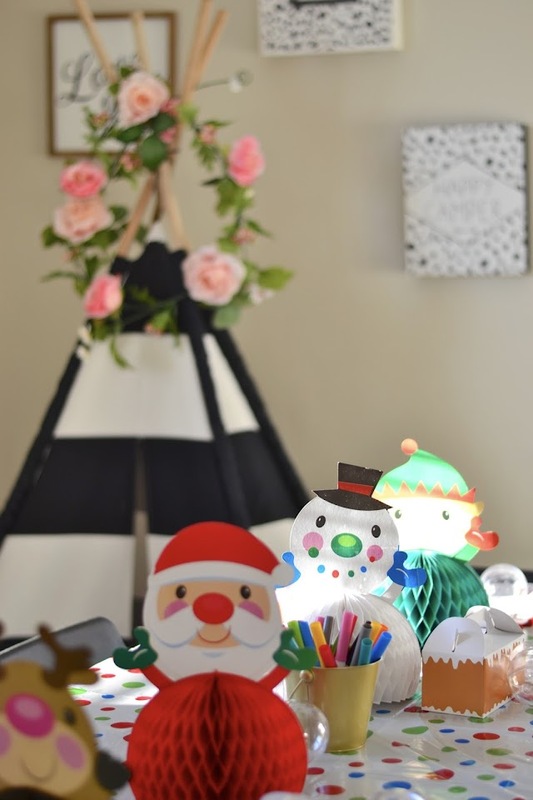 I recommend 2-3 craft projects - kids get distracted easily so you don't want to overwhelm them but also have enough to keep their creative juices flowing. 2. Get washable markers! Easy peasy! No mess, no stress! 3. Order pizza! Kids love it and you will be stress free! I thought about cooking dinner but quickly retracted on that idea. And everyone was happy. Let them be little! The playroom was the biggest mess than night but my heart was full and the kids were happy. We loved making the ornaments and they got to take home a personalized piece with them. After crafting they played hide and go seek and read books... this was truly a day to remember for me and them. ps: make sure you add a bottle of wine to the list of things to get and you will be just fine. Hope you enjoyed this post and head over to Oriental Trading for any of the items you see above. Happy Merry Christmas Time!